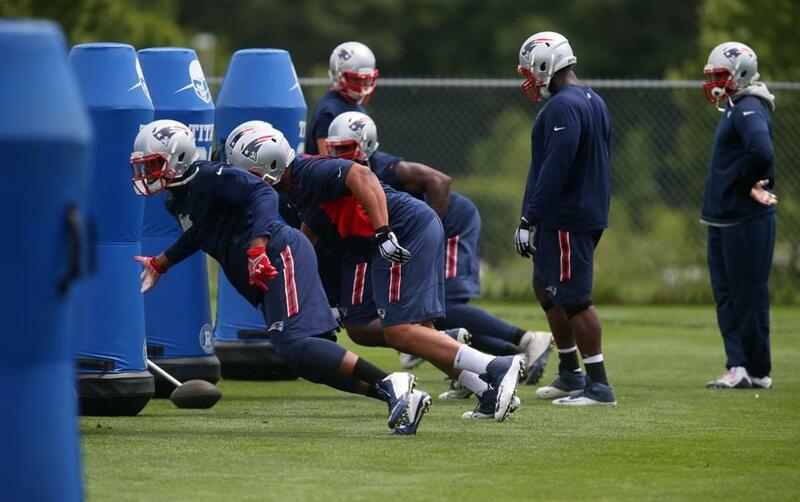 The Patriots wrapped up their mandatory minicamp on Wednesday at Gillette Stadium. Fort Foxborough has gone dark for the offseason. The Patriots wrapped up their offseason program and mandatory minicamp on Wednesday. Stripped of numbers on helmets or shorts or practice jerseys that make them easily identifiable and wearing drab standard-issue blue team workout attire that made them look a bit like prison inmates, the Patriots practiced well enough for coach Bill Belichick to cancel the final session, which was scheduled for Thursday. The Patriots won’t return to the practice fields until the final week of July, when training camp kicks off, but they’re never far from the news. Here are a touchdown’s worth of Patriots’ parting thoughts. 1. It will be interesting to see if the rest of the sporting country becomes as outraged over and mesmerized by the St. Louis Cardinals allegedly hacking into the proprietary scouting database of the Houston Astros, whose general manager formerly worked for St. Louis, as it did over the NFL deeming the Patriots removed some air from footballs. The Cardinals’ alleged crime is an actual crime, one that is being investigated by the FBI. Somebody from the Redbirds could end up as a jailbird. Corporate espionage is unlawful, unethical, unscrupulous and unpardonable. The Cardinals, baseball’s model franchise suffused with Midwestern sensibility, have a lot of explaining to do. The Cardinals have retained a law firm, Dowd Bennett, to conduct an internal review into the hacking allegation. An attorney for the team told the Associated Press on Wednesday that so far he was “100 percent confident” that chairman Bill DeWitt and general manager John Mozeliak were not involved. It would have been 100 percent shocking if the firm reached any other conclusion. Perhaps, Cardinals fans should ready their “They Hate Us Cause They Ain’t Us” T-shirts and retorts about antipathy being jealousy. 2. The hearing to review Tom Brady’s four-game suspension from Deflategate is set for Tuesday. The Brady camp sounded a bellicose note this week via the report from ESPN’s Sal Paolantonio that Brady is seeking full exoneration, not a reduction of the suspension. The question is whether Brady is willing to take that rhetoric and posturing and put it into action because NFL commissioner Goodell is not going to vacate the suspension. That will result in a collision of two cherished Brady agendas that will be put directly at odds — the first is protecting his carefully-crafted legacy and the second is not engaging in public acrimony and rancor that could serve as distraction for him or his team. If the Brady camp and NFLPA attorney Jeffrey Kessler push the proceedings to court, it’s not going to put the flawed Wells report on trial. The way to do that would be to sue the league for defamation. Saints linebacker Jonathan Vilma did this during Bountygate, the scandal in which Goodell determined the Saints had incentivized injuring opposing players. Even though Vilma’s suspension was eliminated by former NFL commissioner Paul Tagliabue, who was appointed as an independent arbitrator, the linebacker’s defamation case was dismissed by a federal judge. So, a zero sum, zero suspension strategy for Brady is bold. 3. Remember those heated arguments in 2013 about whether the Patriots had left Brady in the lurch by providing him with rookie receivers Aaron Dobson, Kenbrell Thompkins and Josh Boyce? That’s not much of an argument now. At a career crossroads after a disappointing sophomore season, Dobson looks more focused and more professional than last season, which began with him as an inactive against Miami and ended with him blowing out his hamstring against the Green Bay Packers. No rookie receiver in the Belichick-Brady era has ever had more receiving yards than Dobson had in 2013, when he caught 37 balls for 519 yards and four touchdowns. The numbers would have been higher if he hadn’t suffered a fractured foot that required surgery that set back Dobson’s preparation for his sophomore season. Dobson has gotten a Patriots lobotomy. Free-thinking and personality have been removed and replaced with banal bromides and repetitive pledges of hard work and improvement. But if that is what it takes for him to reach his potential so be it. The Patriots better hope the former second-round pick pans out because they’ve missed the boat on the last two receiver draft classes. In 2014, 33 receivers were drafted. The Patriots took No. 33, Jeremy Gallon in the seventh round. This year 35 receivers were taken in the draft, none by the Patriots. 4. As colleague Ben Volin pointed out, it’s hard to believe it was two years ago Wednesday that Patriots tight end Aaron Hernandez murdered Odin Lloyd. Hernandez was convicted of first-degree murder in the death of Lloyd in April and sentenced to life in prison. It’s yet another reminder of how trivial discussing the air pressure of footballs is. 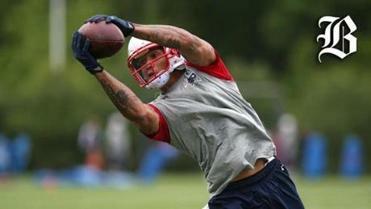 Strangely, it feels like Hernandez never played for the Patriots, like he never existed at Patriot Place. His playing career has been expunged from the record. While his former teammates were practicing at Gillette Stadium on Wednesday, Hernandez was at the maximum-security Souza-Baranowski Correctional Center in Shirley. No one is taking the number off his uniform. 5. The biggest question about the Patriots probably isn’t going to be answered until the season starts — how will they cope at cornerback without Darrelle Revis, Brandon Browner and Kyle Arrington? OTA late arrival Malcolm Butler looks good, and Belichick had nice words for Robert McClain. Rookie Darryl Roberts has flashed and there are reasons to believe Logan Ryan and free agent import Bradley Fletcher could have bounce-back seasons. But it’s hard to get excited about someone locking down Brian Tyms in a padless practice in June.